We have developed a chronically instrumented rat model that uses changes in electroencephalographic waveforms to estimate continuously the degree of central nervous system (CNS) depression induced by thiopental. Such changes were subject to aperiodic signal analysis, a technique that breaks down the complex EEG into a series of discreet neurologic “events” which are then quantitated as waves/sec. We thus obtained a continuous measure of CNS drug effect. In addition we continuously recorded central arterial blood pressure and heart rate and monitored ventilatory status using arterial blood gas determinations. We also determined, with frequent arterial blood sampling, the distribution and elimination of thiopental in individual animals. The time lag occurring in the curve representing arterial concentration of thiopental vs. EEG effect suggests that arterial plasma is not kinetically equivalent to the EEC effect site. 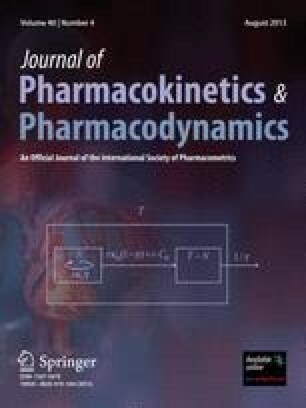 Application of semiparametric pharmacodynamic modeling techniques enabled us to estimate equilibration rate constant (Keo for concentrations of thiopental between arterial plasma and the effect site. The half-life for equilibration of thiopental with the EEG (CNS) effect was less than 80 sec. Knowledge of the rate of equilibration permitted characterization of the relationship between the steady state plasma concentrations and CNS effect of thiopental, as measured by activation and slowing of the EEG. At concentrations of thiopental below 5 gmg/ml, EEG activity was 180% higher than during the baseline awake state. Thiopental produced an activated EEG over more than 20% of the concentration-effect relationship. Further increases in the concentration of thiopental at the site of effect depressed EEG activity progressively until complete suppression of the EEG signal occurred (at which time, the concentration was approximately 80 μg/ml). This report describes our model and its application to the assessment of the pharmacodynamics of thiopental as manifested by changes on the EEG. Supported by grant RO1-AGO4594 from the National Institute on Aging, National Institute of Health; and the Anesthesia/Pharmacology Research Foundation.